The elusive home-baked sandwich bread has plagued me for some time, especially in the years since I’ve converted to all-sourdough breads rather than using the more reliable commercially available yeasts. But once I’d baked this one — and served Loyal Husband J. a ham and cheese on two slices of it 24 hours later, to his hearty compliments — I knew I had a winner. This loaf is now my all-purpose sourdough, equally good for sandwiches, toast, or slathering with butter and serving alongside a hearty bowl of stew. As with all sourdough bread recipes, I add the caveat that the strength and temperament of your individual starter and the climate/weather may slightly change the way your bread dough behaves; it’s best to try this the first couple of times under a watchful eye so you can figure out what works best for you. The night before you want to bake your bread, remove your sourdough starter from the refrigerator. Pour it into a large, clean bowl and vigorously mix in the flour and warm water. (Note: I usually hold 1.5-2 cups of starter in the fridge, so I tend to feed my sponge with 3 cups of flour/water. If you stick with 1 cup of starter in the refrigerator, I’d feed with 4 cups.) Cover loosely with a clean towel, then place in a draft-free place (inside the cold oven works great) and let the sponge develop for 10-14 hours, until very bubbly and active. 5 cups flour — I tend to use a mixture of all-purpose and white whole wheat, about 50-50, as that’s the result my family likes best. You can certainly do all white wheat as you prefer. In the bowl of a stand mixer fitted with a dough hook, combine 2 cups of the sourdough sponge you prepared the night before with the warm milk, brown sugar and cane sugar. Mix at low speed. While the sponge is mixing with the milk and sugar, take any remaining sourdough sponge that you haven’t used, pour into a clean jar (you should have at least 1 cup) and set aside in the refrigerator for future sourdough baking. While the mixer is running, stream in the melted butter, then gradually add the flour and salt until fully incorporated. Turn up the speed to medium-high and let the dough work for about 3-4 minutes, until it’s a cohesive mass (it will be sticky and even slightly runny). Turn the mixer back to low, add the eggs and let the dough mix for another 3-5 minutes, until you have a shiny, smooth and somewhat wet dough. Cover the bowl loosely with a clean towel and set aside in a draft-free place for 2-4 hours, until doubled. 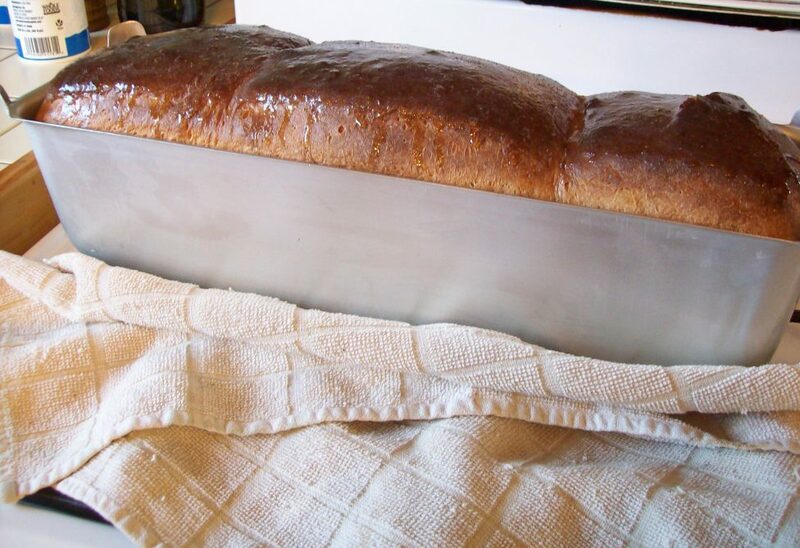 Lightly butter a long loaf pan (16×4 inches). Turn the dough out onto a lightly floured surface, sprinkle with more flour, and divide into 3 equal portions. Adding flour as needed to help you handle the dough, gently form each portion into a smooth ball. Transfer the balls to the loaf pan, end-to-end, to fill the length of the pan and form the eventual loaf without too much mess. Cover the loaf pan loosely with a towel and set aside for another 2-4 hours, until doubled (at this point, the loaf should be nearly to the top of the pan). Remove from the oven and let the loaf cool in its pan for about 10 minutes. During this time, if you’d like, you can run a stick of butter over the top of the hot loaf; I like to do this as it gives a beautiful sheen and keeps the top crust a little softer. After 10 minutes, carefully turn the loaf out if its pan and set it upside-down to cool the bottom and sides without causing sogginess.